• Designed with specific attention on the unique requirements of the ..South African dog and handler. The South African dog and handler are ..vastly different to their American and European counterparts – this ..course adopts a tailor-made approach based on our comprehensive ..experience in the South African arena. • Theory lectures and practicals. 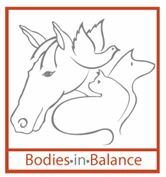 This course includes lectures on ..canine behavioural development, basic canine behaviour, learning ..theory, teaching of exercises, and essentials of running classes as ..well as practical sessions illustrating the above. • Highly experienced tutoring. The course is modeled on the very successful McKaynine Training Centre system (over ..3 500 puppy and 4 500 obedience enrolments) and is operated by one of the country’s leading specialists with ..experience in many different aspects of dog training, from both a theoretical and practical aspect. Many other ..training establishments have sent their instructors to us for training and this will be the tenth year the course is.offered. • Opportunity for self-employment or hobby classes. After successful completion of this course, delegates will have ..much of the knowledge required to run and manage their own puppy or obedience classes. In some cases we do ..suggest additional hands-on experience prior to offering classes to the public. There are eight modules offered which cover behavioural development, theory and practical training of puppies through to adulthood. The highest level of training covered would satisfy the requirements of most owners for domestic obedience. • Per module. There are eight modules, which can be taken individually. In this instance no assignments are included. Books containing the module content and certificates of attendance are provided. • Per course. There are two courses offered. The Puppy course is comprised of six modules (101, 102, 201, 202, 301, 302). The Adult course comprises all of these modules plus modules 401 and 402. Assignments and gradings are included. A certificate of achievement is awarded to successful delegates. Books containing the module content are provided. Being a correspondence course (e-mail or post) it does not matter where you live. You can start whenever it is suitable for you. The course consist of 5 modules – see below for details. Upon registration you will receive the first of 5 modules - the following module will be forwarded to you as you complete each module. You will be required to complete two essays for each module. Your essays will be graded individually and you will receive comprehensive feedback on your submissions. At the end of the course you will be required to complete a special study – subject of your own choice but the topic chosen must be related to the course. Your tutor is a fully accredited, practicing canine behaviour consultant who is eminently qualified to assist you with any queries/problems you may have concerning the completion of your essays and/or final study. Upon successful completion of the course you will receive a certificate from Canine Communications. Provided you have completed all relevant accreditation criteria *), your tutor will assist you with submission of accreditation application. Some practical experience, e.g. 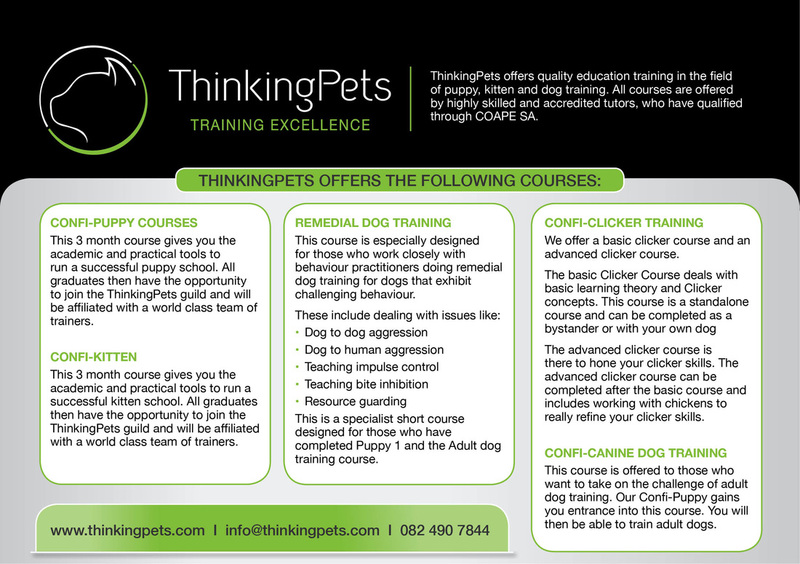 assistance with puppy group / behavioural consultations may also be available for successful applicants (Gauteng only). hugely successful schools and will share their knowledge and experience with you. attend lectures on a Sunday. The lectures are held once a month, and you are then able to assist in a school every week, or more often, depending on which days that particular school has classes. The theory lectures cover all the important information on how and why puppies and dogs do what they do and how to deal with these problems, and most importantly how to assist the client to be the best they can be. You will learn all about observation, the principles of Clicker training – why it is such a successful way of training, what equipment is the best to use on a particular puppy or dog, health, grooming, public relations, how to use TTouch in your classes and how to market and make your school successful. We will also put you in touch with various sponsors. In a nutshell this course offers you the opportunity to have a hands on experience whilst learning, so you are able to apply everything you learn as you learn it, under the watchful eyes of a highly qualified Instructor. What better way to make sure you are able to apply everything you have learnt? These courses are available in Gauteng, Cape Town and Durban at the moment with a possibility of expanding into other areas. We also have a very inexpensive B & B on site in Sandton if you need accommodation.